Moscow (VNA) – Many Russian scholars have highly valued the outcomes of the Communist Party of Vietnam (CPV)’s 12th National Congress, hoping that the Party will continue to lead the country to fulfill tasks set for the next five years, especially keeping national GDP growth at an average of 6.6-7 percent per year. 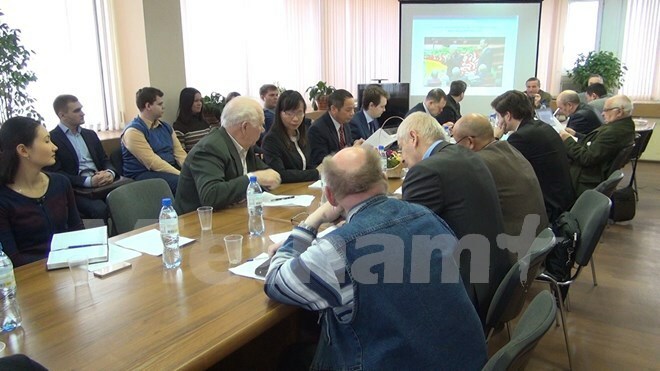 At a roundtable workshop held in Moscow on February 25 by the Far Eastern Branch under the Russian Academy of Sciences, scholars said the CPV has accomplished tasks set by the 11th National Party Congress. The event heard 12 reports that touched upon various topics such as the Communist Party’s role in Vietnam ’s political system, the reality and prospects for Vietnam-Russia ties, national and regional security, Vietnam ’s foreign policy, the country’s economic achievements from 2011 to 2015 and tasks for the next five years. Vladimir Mazyrin, Director of the Far Eastern Branch’s Vietnam-ASEAN Research Centre, said Vietnam’s external political activities over the past five years have contributed remarkably to national stability, helping fulfill tasks set by the 11th National Party Congress and bring the country forward. Vietnam has successfully realised its multilateral foreign policy in international relations, significantly contributing to maintaining peace and stability in the region, and protecting the country’s sovereignty in the East Sea . Pham Duc Vinh, Deputy Secretary of the Overseas Party Committee in Russia , expressed his hope that the research outcomes would chart orientations to advance the time-honoured relationship between Vietnam and Russia . The 12th National Party Congress, which took place from January 21 to 28, elected a 200-member Party Central Committee with 180 official and 20 alternate members.